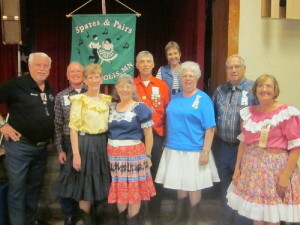 September 12, 2018 – Spares & Pairs Square Dance, Bloomington, Caller Randy Dougherty, Cuer Robin Fryman. Dancers present were from County Line Squares, Dakota Grand Squares, Hot Foot Stompers, South Metro Stars, Spares & Pairs, Square & Twirl, and Triple T. Also present were County Line Squares Queen Gael and King Doug, Spares & Pairs Queen Jennifer and King Barry, SDM Vice Chair Barry Downs, SDM Treasurer Gael Zachman, SDM Executive Director LeRoy Elfmann, SDM Historian Al Martin, and SDM Membership Director Mary Kay Amberg. County Line Squares claimed a Spares & Pairs banner. County Line Squares with Caller Randy Dougherty.